Neuromuscular Dentistry really works wonders as the solution to the pain and suffering of undiagnosed TMJ or TMD. Many people suffer from strange symptoms such as headaches, ringing in the ears, neck and shoulder pain and popping sounds in the jaw that range from mildly annoying to very painful. Unfortunately, the cause of their symptoms may go undiagnosed for years. That’s where Neuromuscular Dentistry really works wonders as the solution to the pain and suffering of undiagnosed temporomandibular disorder, better known as TMJ or TMD. TMJ and TMD are terms describing problems of the jaw, the jaw joint and the surrounding facial muscles that control chewing and movement of the jaw. The temporomandibular joint (TMJ) is the hinge connecting the lower jaw (called the mandible) to the temporal bone (in front of the ear on each side of your head.) The temporomandibular joints are flexible, helping the jaw to move easily, both up and down and side to side, and making it easy for us to talk, chew, and yawn. There are a number of muscles attached to and surrounding the jaw joint as well that help to control the way the jaw is positioned and the way it moves. TMJ is a chronic, degenerative disease that can take years to develop and affects millions of people. Neuromuscular Dentistry, therefore focuses on realigning the bite and resolving issues related to TMD. With the goal of eliminating symptoms by working with the hard and soft tissues, muscles and nerves that control movement, pressure and mouth functions. 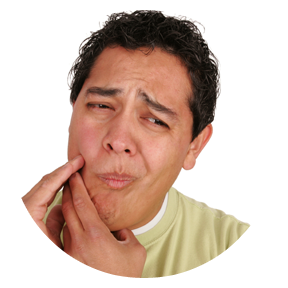 A misaligned bite can cause a host of symptoms, from headaches and shoulder pain to loose teeth, to tingling in your fingertips that may seem unrelated. This makes it difficult to easily get the diagnosis you need in the early stages. If you’re suffering with the symptoms of TMJ / TMD, don’t wait a moment longer to get the help you need. In a short time, Dr. Mathew can help reduce or eliminate your pain and discomfort, offer you better health overall, and restore your smile. Please contact Artisan Dentistry in Salem, New Hampshire and Newburyport, Massachusetts today to schedule your free consultation.